Blue Agave originates from Mexico, where it is also referred to as Aguamiel, which translates to "honey water." It is also native to South America and the Southern states of the USA. The superfood has been used by traditional cultures in these areas for many years, but in the last twenty years, it has also seen a boom in demand worldwide. Although most parts of the plant can be used in some form, agave is perhaps most well known for the products derived from its sap – blue agave syrup and powder. Both products can be used as a natural sugar replacement. They are versatile ingredients that can provide added sweetness and a unique flavour to cereals, fruit salads, ice creams, or baked goods. As well as being versatile and great tasting, agave presents a range of health benefits. The agave plant was an important part of the traditional Aztec culture. Due to the versatility of the plant, it provided food, drink, medicine, and even clothing for the native people. Aztec warriors are thought have used a blend of agave and salt to treat their battle wounds. Superfood Ingredients provides two 100% organic blue agave products, both of which are grown in fertile volcanic soils in Mexico. Slightly sweeter than honey, our Organic Agave Syrup is produced from the sap of the agave plant, which is filtered and then heated at low temperatures. The syrup is available as dark, medium and light varieties, and makes a great addition to baked goods, cereals, and smoothies. Our Organic Agave Powder is also extracted from the sap, and has the added benefit of being soluble in water. It is suitable for use in beverages and yoghurts, as well as a natural sugar replacement. Not only is agave a versatile ingredient, it also offers a wide range of potential health benefits. From its low GI value and calorie count, to its concentration of soluble fibres and saponins, agave is one natural sugar replacement that packs a nutritional punch. 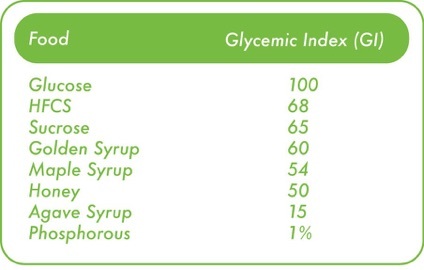 Agave nectar and powder both have low glycemic index (GI) and glycemic load scores, particularly compared to traditional sweeteners such as white cane sugar. This may be due to the fibre content of the superfood, along with the higher than usual fructose levels, which are absorbed more slowly than many other forms of sugar, as can be seen in this comparative table. The low GI value means that consuming agave does not cause a sharp spike in blood sugar levels, which would typically result in an increased demand for insulin production. Over time, this can lead to a reduced insulin sensitivity, which can cause weight gain, and increase the risk of developing heart disease and diabetes. As agave does not seem to invoke this drastic insulin response, it may be suitable as a sugar replacement for those looking to reduce their risk of developing these chronic diseases, and maintain a healthy, balanced lifestyle. Agave products contain the soluble fibre inulin, which has been recognized for its wide range of health benefits. Studies have suggested that inulin can act as a prebiotic, which may help to promote gut health and increase the absorption of certain micronutrients, including calcium. It may also play a role in weight loss, by helping to increase satiety and improve insulin sensitivity. Inulin has even been linked with decreased cholesterol levels, which may reduce the risk of developing heart disease. Pound for pound, Superfood Ingredients’ agave syrup is much lower in calories than most other traditional sweeteners. It is estimated that a cup of typical cane sugar contains approximately 300 calories more than the same amount of agave syrup. For these reasons, this superfood may be an effective sugar alternative for those looking to minimize weight gain and maintain a healthy body composition. Agave contains saponins, chemical compounds that are thought to have anti-inflammatory characteristics. Inflammation is a precursor for many different chronic diseases, including arthritis, diabetes, heart disease and even certain cancers. Hence, keeping inflammation to a minimum could be a key factor in maintaining lasting wellness. In addition to their anti-inflammatory effects, saponins also have anti-microbial properties. Applying agave nectar to the skin has been shown to be an effective defense against pyogenic bacteria such as Staph infection. Consuming agave regularly may also help to ward off parasites and fungal infections, as well as helping to maintain a healthy gut flora. This may improve gastro intestinal symptoms such as bloating and diarrhea, and make certain nutrients more bioavailable. Our wholesale Organic Blue Agave Syrups and Organic Blue Agave Powder are available in bulk format which we ship by the pallet directly from Mexico to all parts of the globe. Please contact us if you are interested in wholesale bulk supply of our Organic Blue Agave Syrups and Organic Blue Agave Powder. As consumers become increasingly conscious of the potential negative impacts of using processed sugars and artificial flavourings, the demand for natural alternatives continues to grow. Blue Agave is currently one of the most popular choices, used as both as a syrup and dried powder. Due its low GI rating and high fibre content, it is enjoyed worldwide as a natural sugar replacement and flavour enhancer.